The CSA B51 CRN format is an initial letter followed by 3 to 5 digits, a decimal point and the next digit which specifies the province of first registration. 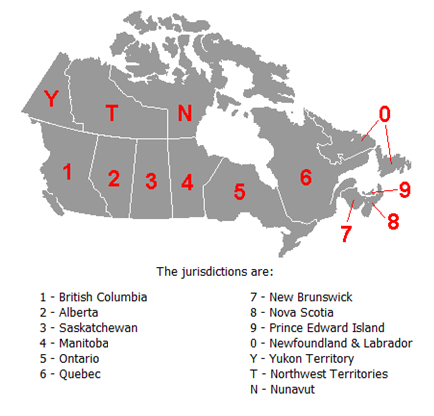 Additional digits indicate other provinces that have also accepted the design. A2170.8 A vessel registered in Nova Scotia: note the standard format used of a letter, 4 digits, decimal point, and provincial of first registration (8 = Nova Scotia). K2478.15 Another conventional CRN: a letter, 4 digits, decimal point, province of first registration (1=B.C.) followed by another province that has also accepted the design based on re-review or acceptance of the first provinces review (5 = Ontario). D07726.6 A Quebec issued 5 digit number (The first digit is kept 0 to allow Alberta compatibility). If this vessel was also reviewed by Alberta, the ABSA returned CRN would be D7726.62, dropping the leading zero. 1811.9 A CRN with no starting letter – issued by ACI for use in Prince Edward Island. 769.T rev.1 3 digit Northwest Territories format, revision 1. No leading letter. Vessels and fittings must be registered in each province where they will be used. The order that the different provinces reviewed the same design is a critical part of the CRN system. A1234.51 (vessel registered first in Ontario, later the same design accepted in B.C. is not the same vessel as A1234.15 (vessel first registered in B.C., later also accepted in Ontario). 5AN7004 A single use registration for used or altered vessels in Ontario. ALD-14-016 Alberta Limited Design on a cold stretched vessel – This registration is limited to a list of serial numbers and a list of ultimate vessel owners. ACCEPT536 An Ontario variance on an unusual design. Typically to a non-ASME code of construction. The digits after the decimal place indicate which provinces have accepted the design. The first province of acceptance always follows the decimal point. If a CRN is to be updated, revised or renewed it must be re-accepted by the first province before the others can also accept it. The starting letter is not always unique to a province. The fictitious CRNs A1234.23 and A1234.32 are two different vessels, the first registered in Alberta, and then in Saskatchewan. The second, a different vessel, is first registered in Saskatchewan, and then Alberta. 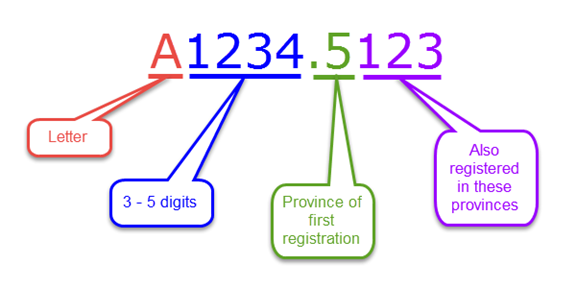 The CRN number cannot be guaranteed to be unique until the first province of registration as indicated by the first digit after the decimal point is included. One of our first large registration jobs was for a line of standard vessels registered Canada wide. Our customer had been applying for CRNs across Canada as required without referencing previous registrations for the same vessels elsewhere in Canada. Each vessel ended up with many different CRN numbers, added as they were sold into new provinces. The CRN for the province being sold into was being stamped into the nameplate before shipping. This worked only as long as the ultimate province of use was known at the time of production and the vessel was not re-sold. Problems arose as the vessels were sold to one province, put on skids and shipped to another – additional CRN numbers had to be stamped onto the nameplates in the field. Stamping all the CRN numbers in the nameplate was not practical due to space limitations. 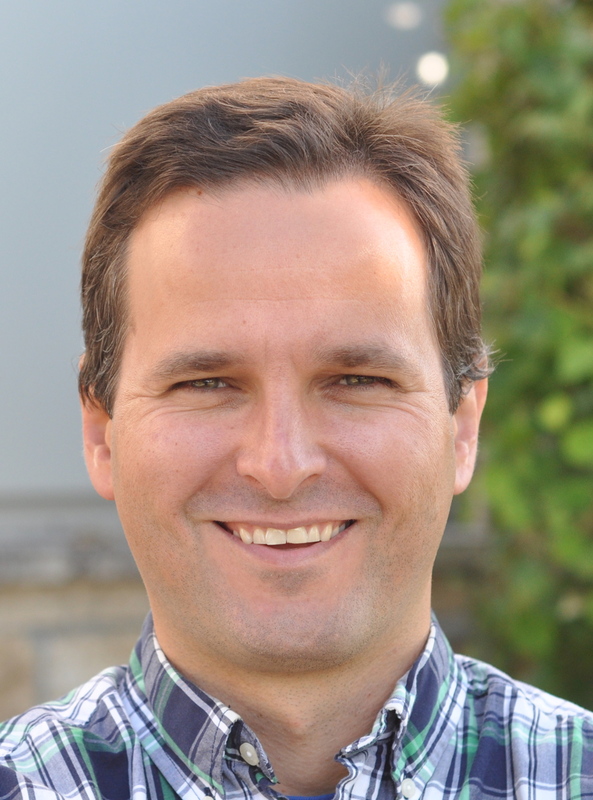 Canada wide registrations based on one number per vessel solved this problem.